Stoma Advanced Dental Care is equipped with a good team of experienced Endodontists who will study your condition before administering any treatment. We provide you the best in endodontic care with technologically advanced facilities and modern dental practices. 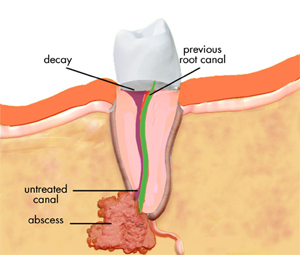 A root canal can save a tooth that would otherwise not survive due to severe damage, infection or decay. Although there is a popular misconception that root canals are painful, they are in fact a comfortable general dental procedure that is designed to bring patients out of pain. If you are experiencing discomfort from an infected tooth, trust Stoma Advanced Dental Care for top quality root canal therapy. We maintain a warm, comfortable environment and are proud of the individual attention we offer to each patient. State-of-the-art techniques, such as the surgical operating microscope to enhance efficiency and treatment results, are used. We hope that the information provided here answer many of your questions about endodontic treatment. If you would like additional information, please don't hesitate to contact us at Stoma Advanced Dental Care. Root Canal Treatment is needed when the blood or nerve supply of the tooth (known as the pulp) is infected through tooth decay or injury. You may not feel any pain in the early stages of the infection. In some cases your tooth could darken in color which may mean that the nerve of the tooth has died (or is dying). At your initial appointment dentists will conduct a comprehensive examination to diagnose orofacial pain and pulpal injury and determine if the tooth needs endodontic therapy (root canal treatment). Most endodontic treatment can be done the same day as the consultation. However, a complex treatment plan or medical history may require an evaluation and a second appointment to provide treatment on another day. Please assist us by providing the following information at the time of your consultation. Your endodontic referral slip and any x-rays, if applicable. Please note that we may take our own x-rays to provide you with a comprehensive diagnosis. Preliminary treatment removes the decay and the source of infection of the pulp, and also determines whether the lost tooth structure can be restored. If a fracture of the tooth has reached the pulp, or infection is associated with gum disease, it could be more difficult, if not impossible, to save the tooth. Local anaesthesia is administered via injections to numb the tooth to be treated and the surrounding tissues. If the pulp in a tooth is acutely inflamed, and therefore very painful, it may take a while to get it numb, but your dentist will not start the treatment until it is. An opening is made in the crown to reach the pulp. Root canal filling material (gutta percha) is placed in the canals and the tooth is sealed with a temporary filling to protect it from contamination. Then a crown is usually placed over the tooth to seal and protect it from recontamination and future damage. After the procedure, an antibiotic may be prescribed to treat or prevent infection. Be sure to follow the instructions of your dentist or endodontist carefully. After- effects of treatment are minimal, generally lasting from a couple of days to about a week. It is normal to have some minor discomfort after treatment including slight soreness that can usually be managed with over-the-counter (aspirin, ibuprofen) medications or prescription (codeine-type) drugs, or a combination of the two. In some cases, new problems can influence a tooth that was successfully treated. Once retreatment has been prescribed. This procedure encourages the root to continue development as the pulp is healed. The injured pulp is covered with medication to encourage growth. The tip of the root (apex) will continue to close as the child gets older. In turn, the walls of the root canal will thicken. If the pulp heals, no additional treatment will be necessary. The more mature the root becomes, the better the chances saving the tooth. In this case, the unhealthy pulp is removed. 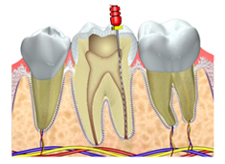 The endodontist places medication into the root to help a hard tissue form near the root tip. This hardened tissue provides a barrier for the root canal filling. At this point, the root canal walls will not continue to develop, making the tooth susceptible to fractures. So it is important to have the tooth properly restored by your dentist. 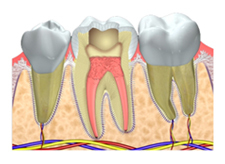 This type of crack extends from the chewing surface of the tooth and vertically migrates towards the root. In some cases, the crack may extend below the gum line. It is possible for the crack to extend further into the root. Damage to the pulp is common place. In this case, root canal treatment is usually necessary. A cracked tooth that is not treated will worsen, resulting in the loss of the tooth. Therefore, early detection is essential. Craze Lines : These are tiny cracks that only affect the outer enamel of the tooth. These cracks are more common in adults. These types of cracks are superficial and are usually of no concern. Split Tooth: A split tooth is usually the result of an untreated cracked tooth. It can be identified by a crack with distinct segments. This type of tooth can never be saved intact. Yet, the position and extent of the problem will dictate whether any portion of the tooth can be saved. Sometimes, endodontic retreatment by dentist and restoration by your dentist can be used to save a portion of the tooth. Vertical Root Fracture : A vertical root fracture begins at the root and extends towards the chewing surface of the tooth. Unfortunately, they show minimal symptoms and may go unnoticed. 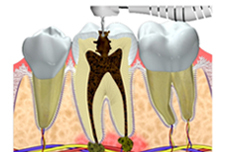 Treatment involves endodontic surgery if a portion of the tooth can be saved by removal of the fractured root. Otherwise the tooth will have to be extracted. Avulsed Teeth: If an injury causes a tooth to be completely knocked out of your mouth, it is important that you are treated immediately! If this happens to you, keep the tooth moist. If possible, put it back into the socket. A tooth can be saved if it remains moist. You can even put the tooth in milk or a glass of water (add a pinch of salt.) 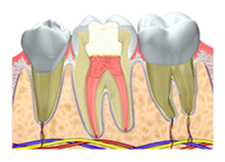 Your Endodontist may start root canal treatment based upon the stage of root development. The length of time the tooth was out of your mouth and the way the tooth was stored, may influence the type of treatment you receive. Stoma Advanced Dental Care offers a good team of experienced Endodontists who will study your condition before administering any treatment. We provide you the best in endodontic care with technologically advanced facilities and modern dental practices. If you seek additional information, please don’t hesitate to contact us.